A Celebratory Giveaway! One ebook copy of NEVER TOO LATE! ALWAYS A STRANGER (Book 2) is "finished" and currently in the hands of my wonderful agent, Jessica! If she gives it a thumbs up, its next stop is my wonderful editor, John, at Kensington. 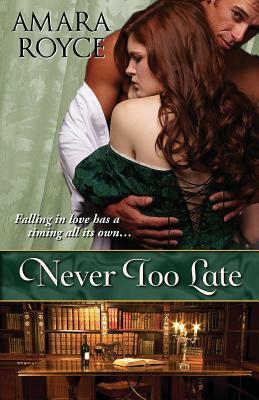 And August 2 will be the three-month birthday of NEVER TOO LATE! I've been awestruck at my debut historical romance's reception these past few months. It's gratifying to know that people enjoy the story and that people appreciate these characters, the "older" heroine, the younger man, stable characters who would, technically, have continued to live contently without knowing each other, but who are so much better together. So, anyway, it seems like a great time for a giveaway! So I'm giving away one ebook copy of NEVER TOO LATE this week! There are multiple ways to enter so enter early, enter often! Giveaways is open to US residents only and ends August 5, 2013. It seems that now, more than ever, we need ways to connect with, to empathize with people whose lives might be a mystery to us. Whether because of culture or gender or some other element, we may see them as different, as "Other." Perhaps part of it is how we've been raised. Perhaps part of it is the way cultural stereotypes pervade so much of our society. Perhaps part of it is being invested in the world we know and anxious about how new things, new cultures, new people might change that world. One of literature's greatest benefits is its ability to give us a glimpse into lives we otherwise might not know. We can see how those lives are perhaps dramatically different from our own, for good or ill, and also see how much we share...how many of our challenges and struggles are common. We can see humanity. Jennifer Zobair's debut novel PAINTED HANDS is probably best categorized as women's fiction, possibly even a cultural and political version of chick lit. It focuses on contemporary American Muslim women--high-powered professional women--and how they navigate through careers, politics, religion, and love. It touches on so many common women's issues and so many common relationship issues. It's beautiful, and it's valuable, and it has the potential to help us connect, help us empathize, help us be more of a global community.